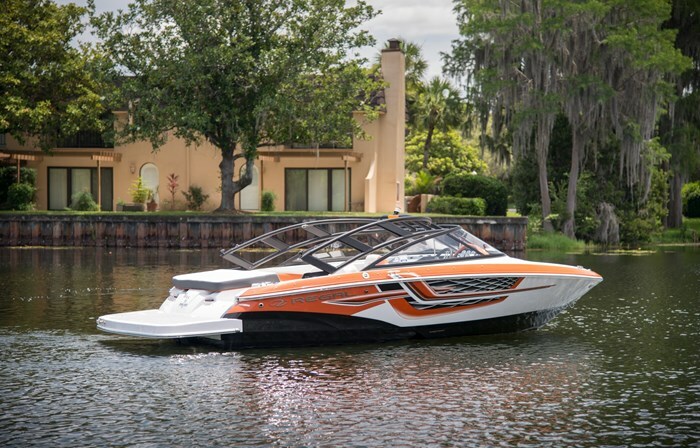 Regal Boats of Orlando, Florida has introduced four all new models for 2018 and has renewed several other models. 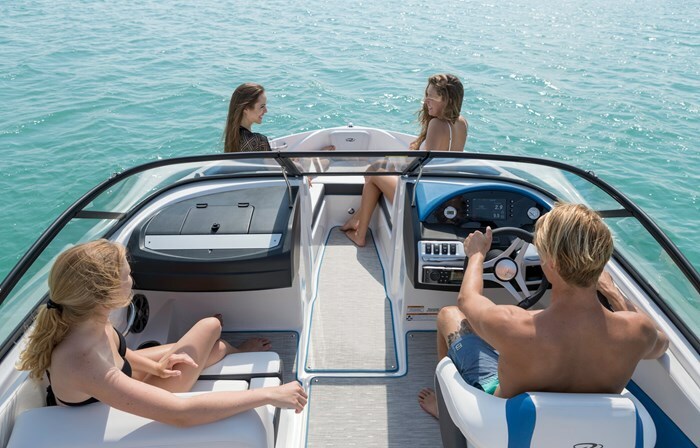 By adding surf-specific features to its highly successful and popular entry level 1900 to create the 1900 Surf, Regal has created a highly versatile bowrider that not only provides all of the features and amenities of the 1900 for cruising and watersports activities but adds to these the bonus of surfing. There are three major additions to the 1900 which transform it into the 1900 Surf. Start with Volvo’s Forward Drive sterndrive available in either the 200 horsepower Volvo V6 200 or the 240 horsepower Volvo V6 240. What the Forward Drive provides is Volvo’s Duo-Prop drive for better efficiency and torque delivery plus the real bonus of placing the propellers well forward of the 1900’s transom thus providing a highly desirable margin of safety for the surf rider who may be only a few feet behind the boat. 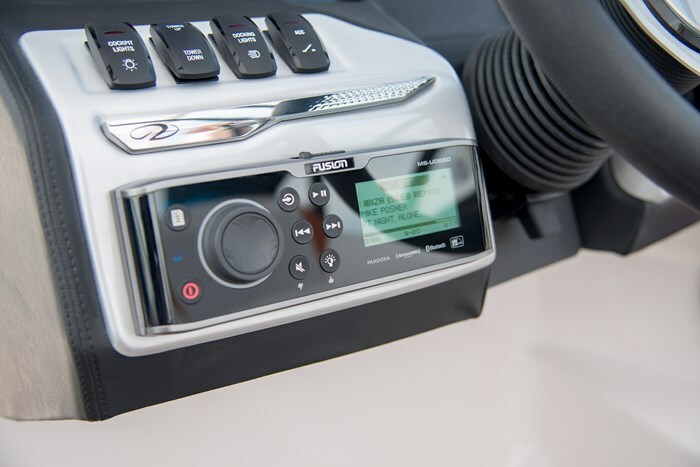 The second major addition to the 1900 to create the 1900 Surf are the standard equipment wave-shaping Surf Tabs used to help create “the ultimate custom wave.” The third major standard equipment addition is the inclusion of Regal Marine’s in-dash RegalVue digital screen with standard Surf Control. 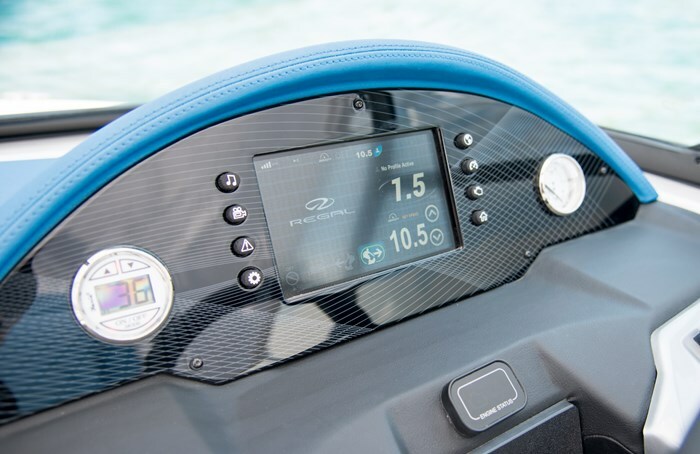 RegalVue not only provides all normal engine function readouts, it also provides a navigation screen, audio controls, and with the Surf Control, allows you to choose your speed, pick a wave direction, deploy the Surf Tabs, and remember and recall a surfer’s individual preferred settings. You may optionally add Cruise Control to this. There are several standard features of the 1900 that carry over to the 1900 Surf to enhance its surfing capabilities. There are three major hull design features that contribute to this. The first is the 1900’s beam which at eight feet, three inches is one of the beamiest nineteen-foot bowriders. 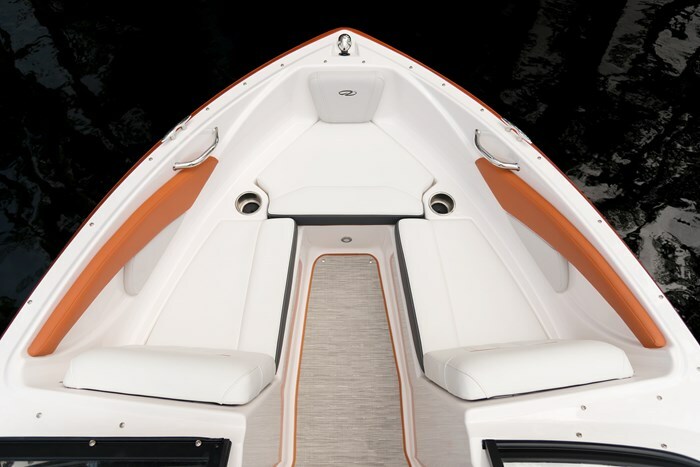 This wider beam not only provides more interior room but also puts more boat in the water allowing the Surf Tabs to perform better. The second attribute is Regal’s patented FasTrac hull design with its full-beam step thus creating an aerated bottom for dramatically reduced friction and thus providing what Regal claims are up to 26% faster cruising speeds, up to 30% better fuel economy, and better handling and performance especially when coupled with Volvo’s Forward Drive. The third surfing advantage of Regal’s 1900 hull design is its comparatively very deep 22-degree deadrise hull which not only provides a smoother ride in rougher water, but for surfing, allows the stern of the 1900 Surf to be lower in the water to enable the creation of desirable surfing waves behind the boat. The interior of the 1900 Surf is identical to Regal’s 1900 ES (Extended Seating) Bowrider with a large extended swim platform with concealed stainless steel boarding ladder, transom walk-through next to a transom sunpad, a fully adjustable helm bucket seat with forward flip-up bolster, plus a passenger side full L-shaped lounge along the port side and across the transom. The front passenger portion of this lounge is double-wide and incorporates an adjustable backrest which allows both forward and aft-facing seating. The bow seats allow forward lounging utilizing the padded backrests on the forward face of the two consoles. A huge storage area is accessible within each of these consoles plus under all cockpit seating. A 25 quart Igloo portable cooler with dedicated storage is standard. 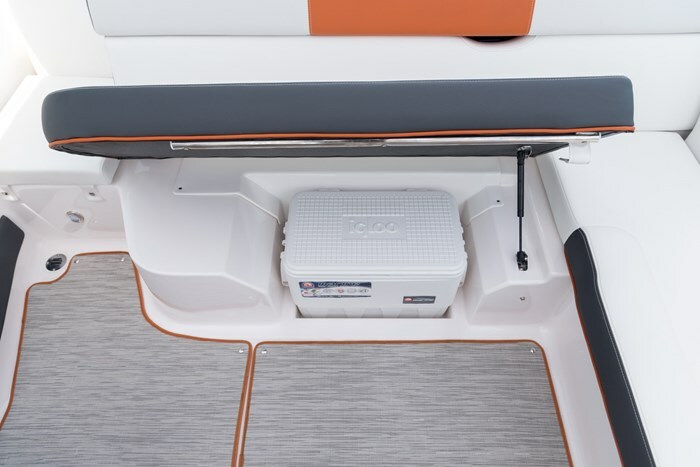 A centre cockpit in-floor storage compartment is ideal for watersports accessories. Other notable standard equipment on Regal’s 1900 Surf includes blue LED courtesy lighting, a Bluetooth-compatible Fusion stereo system with four, 200 Watt cockpit speakers plus full smart phone integration, transom walk-through filler cushions, ski-tow ring, lockable glove box, digital depth sounder, battery switch, plus a vinylester hull barrier coating. Standard Classic hull colour is white with eight choices of bootstripe colour. 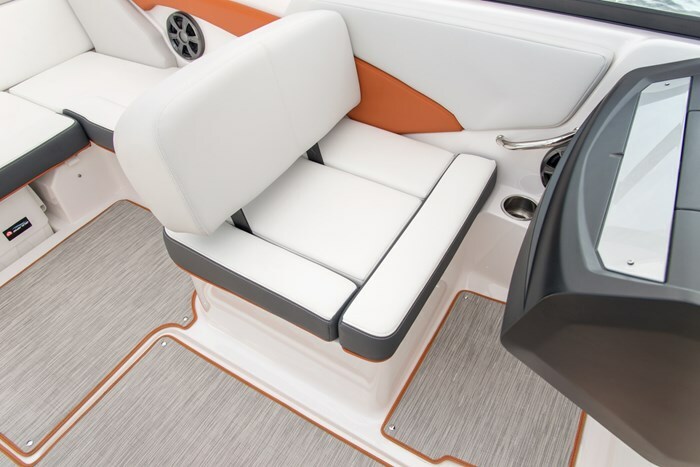 Choose from eight Custom hullside colours, or from eight Premier full hull colours, or join the surf look with the ESX package which provides four choices of Regal X-Treme hullside colours with graphics plus colour-matched interior upholstery accenting. 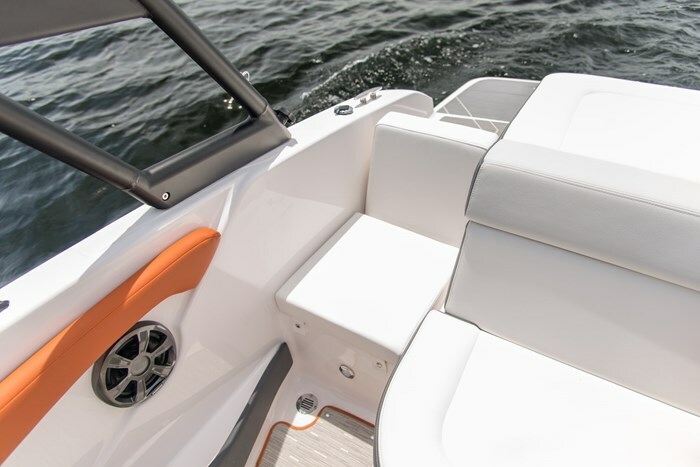 Notable optional equipment includes an automatic fire extinguishing system, transom trim switch, a black sport tower, bimini top, bow and cockpit and travel covers, cockpit flooring with snap-in carpet, Seagrass mat, or SeaDek, plus a high performance stereo upgrade. 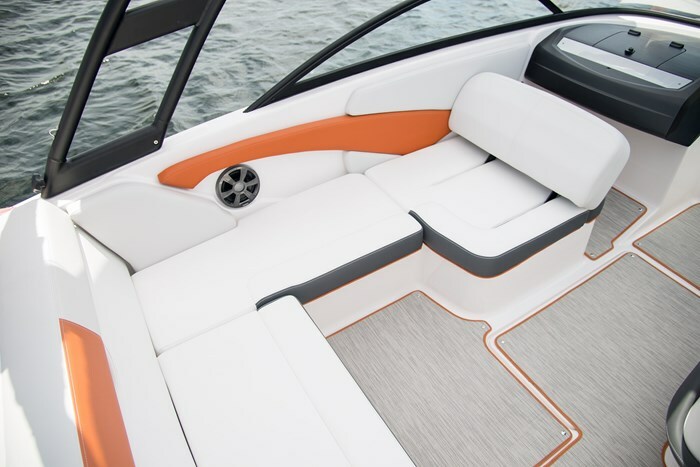 In Regal’s own words, the “19 Surf is the only 19′ boat on the water with the versatility to raise your adrenaline levels and comfortably cruise to your favorite sand bar.” Yes, versatility is the key in describing Regal’s new 1900 Surf.